At Cats Protection when we rehome cats and kittens, we work hard to find the perfect match between pet and owner – a match that will best-suit both parties’ circumstances. Ideally all cats would have access to outdoors to express their natural behaviours. However we also know that, like humans, cats are individuals with varying needs and preferences. Some cats love going outside, while some barely put a paw through the cat flap. It’s recommended that some cats are kept indoors for their own benefit, such as blind cats or those with a medical condition such as Feline Immunodeficiency Virus (FIV), which have to be kept indoors and are only allowed outside in an impenetrable garden or safe run. If you are considering starting a brand new life with an indoor cat, there are a number of important factors to consider. No matter how well a property is prepared, you can’t guarantee your cat won’t find their way outside. Therefore regardless of whether your cat lives indoors only or has access to outdoors too, it’s vital that they are microchipped, neutered, vaccinated and provided with flea and worming treatment. Given that a house cat isn't as familiar with their neighbourhood as one that spends time outside, ensuring your cat is microchipped maximises your chances of being reunited with them if they do get lost. Neutering, meanwhile, means your cat is less likely to get serious diseases through mating and reduces the chance of males spraying. Read more about the benefits in our post: Why should I neuter my cat? If you need to keep your moggy indoors, you’ll need to ensure your property is set up to accommodate them. This includes taking care when entering and exiting the building and screening open windows and doors in order to prevent escape. A household environment can pose many dangers to curious kittens and cats. It’s important to ensure there are no toxic houseplants or household products accessible to them. It’s also a good idea to keep cupboards, washing machines and tumble driers closed and toilet lids down. The outdoor environment provides so much more for cats than simply a place to exercise and you’ll need to ensure these benefits are replicated inside. That includes providing places for them to scratch, hiding areas and high resting places where they can feel secure and interesting areas and objects for them to investigate. It’s also important to offer sufficient resources. If you have more than one cat, offer enough resources in different locations where your cats can eat, drink, toilet, rest and hide. 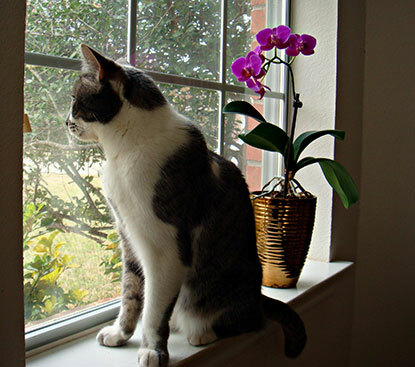 Outdoor pursuits provide a great deal of stimulation for cats, keeping them happy and healthy. For those lacking outside access, this stimulation has to be found inside. This can be achieved by upping the time you spend with your moggy and by ensuring your property provides a sufficiently interesting environment for them. You can keep your cat stimulated, and allow them to exhibit their natural hunting behaviour, through use of different toys and by hiding tasty treats around the house for them to discover. If they are not allowed outdoor access, your cat may suffer from frustration if they are unable to exhibit their natural behaviour. Look out for behavioural problems such as scratching furniture, spraying, over grooming, aggression, house soiling and depression and be ready to take measures to identify and address the causes. Oversleeping can be another sign of boredom. If your cat’s behaviour changes, it’s important to take them to the vet for a health check. If there is no medical reason causing the behaviour, you may find guidance from a qualified behaviourist useful, such as a member of the Association of Pet Behaviour Counsellors (www.apbc.org.uk). By recognising and satisfying their needs, you can ensure your indoor cat enjoys a happy and fulfilling life. For more advice on how to look after indoor – as well as outdoor – cats, please read our Essential Guide: Indoor and outdoor cats. My 15 year old cat is showing signs of depression since my other cat was put to sleep. I play with her much more now but it doesn't seem to help. Hi Patricia, sorry to hear about this. A behaviourist has explored whether pets grieve in a past issue of our supporter magazine, The Cat. You may find the article useful, you can read it at http://www.cats.org.uk/uploads/documents/The_Cat_Mag_extracts/Behaviour_-_do_pets_grieve.pdf. Please copy and paste the address into your address bar to view it. Hope it's helpful. Hi Diane, the above information will help you to ensure your cat has enough resources and that the environment is interesting to keep them stimulated. Also have a read of our leaflet about moving house: www.cats.org.uk/uploads/documents/cat-care-leaflets-2013/EG03_Moving_house_JUN14.pdf (you'll need to copy and paste the link into your address bar). I would like to have an indoor cat. Could you recommend which type of cat is best to get? Also do you know a charity (or organization) who would look after my cat When I am away sometimes? kind Regards.